Congratulations to Julie and Josh who have installed Saskatoon’s first residential green roof with help from Michael Molaro, Higher Groundwork HortiCulture (green roof consultant). Julie’s blog, juba life, has photos and explanations showing how they prepared the roof and laid out the plants. It’s a great resource if you are thinking about adding a green roof to your home. 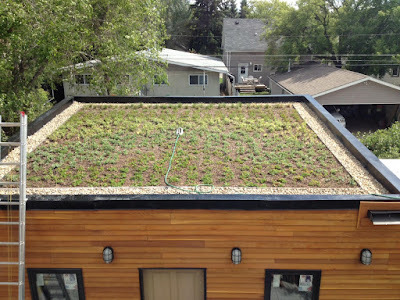 Michael Molaro selected the plants based on his experience in installing the green roof at the U of S College of Law. Over 700 individual sedums, June grasses, pasture sage, and allium were planted on the garage roof, with taller plants at the far end so that every variety can be seen from the house. Green roofs capture and control storm water runoff, reduce urban heat, and add to a city's biodiversity. Toronto is the first city in North America to have a bylaw requiring and governing the construction of green roofs on new development. France has recently decreed that new roofs must have either solar panels or plants. For more information about green roofs, take a look at our 2014 interview with Michael Molaro. 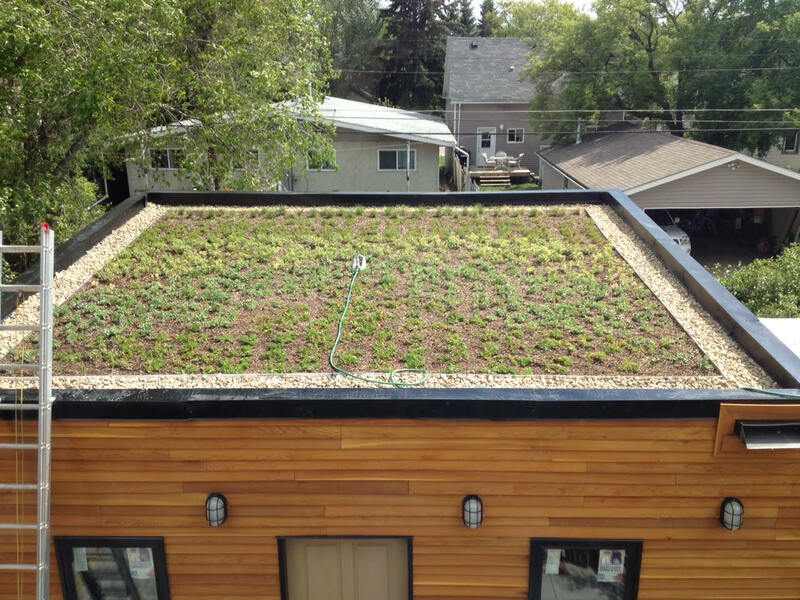 Addendum: Michael Molaro has pointed out that there are a few small residential green roofs already in place in Saskatoon, but this roof is the first one of a significant size.